The opener is arguably the most complex part of your garage door. It’s also one of its most important components, and it can be challenging to fix when something goes wrong. Our company can provide you with excellent solutions to any type of problem your opener may suffer from. 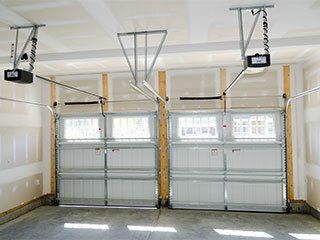 Contrary to what many homeowners believe, a garage door opener does not do the heavy lifting. All the weight of your garage door is supported by the springs, and your opener is purely responsible for powering the door's operation. Think of it like an engine, as it is an electro mechanical motor in essence. Any disruption to the smooth movement of your door is often a sign that some part of this device is in need of attention. Although a garage door opener is designed to work smoothly and efficiently for many years, wear and tear damage can gradually degrade the condition of some of their components and cause them to break down. Motor gears can wear out, and circuit boards can get fried or become detached with some important wires, not to mention their drive-system can also unexpectedly break due to rust or some other malfunction. As for the drive systems, garage door openers usually utilize one of three types: Chain-drive units use – as the name suggests – a chain, which means they can power the movement of heavier doors, but also that they will be quite loud and will require more frequent maintenance and adjustment. Belt-drive openers work similarly to the previous type, except, they use a belt instead of a chain. They are known for their smooth and silent operation, but also for being slightly more expensive. The third type is the screw-drive, and it is usually favored for its minimalistic aspect. Units of this type use far fewer moving parts and therefore require much less maintenance. Finding the perfect opener for your door is no easy task. The various safety and security features available, not to mention the type of unit that will work best, can be difficult to determine. That's what our experts at Garage Door Repair Portland are here for. We'll help you choose the best opener for your specific needs. Call us today.